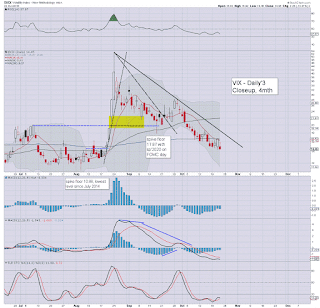 With equities closing significantly higher, the VIX resumed cooling mode, settling -13.5% @ 14.45. Near term outlook is for continued equity upside, which will likely equate to VIX 13/12s. The key 20 threshold looks out of range at least for another 5-6 trading days. VIX is naturally being ground lower as the equity market resumes 'normal service'. Right now, it is looking like we've seen the VIX high of the year (53s). At best... volatility bulls might see VIX briefly trade in the 20-25 zone once or twice before year end. 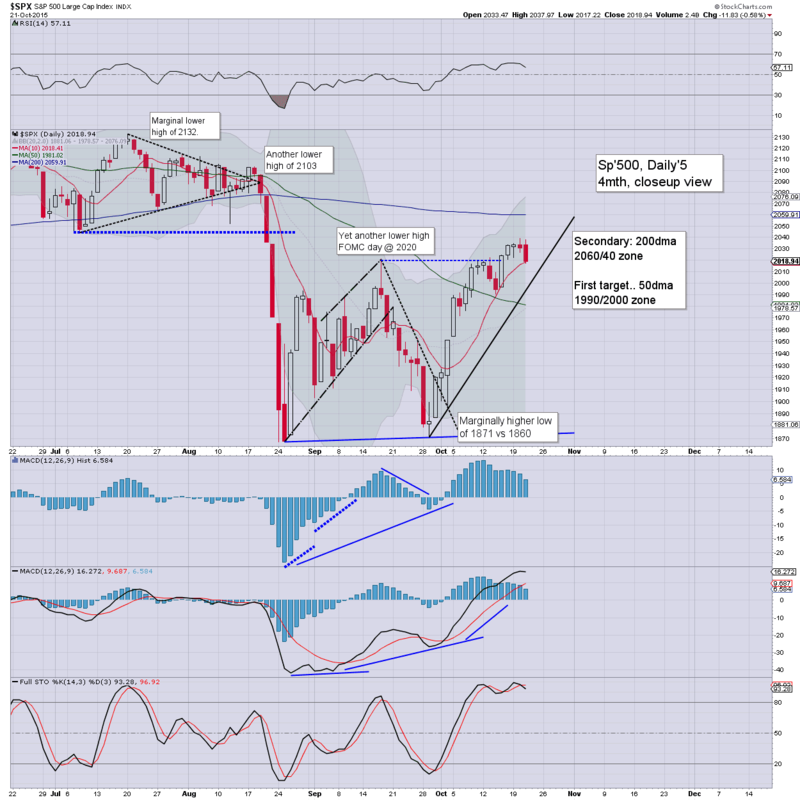 Unquestionably.. a day for the equity bulls, as the market negated yesterday afternoon's nonsense. Far from the rally running out of steam... price momentum is INCREASINGLY favour the bulls with each day. For now.. this is absolutely no market to be short. 4.24pm.. Earnings from AMZN, GOOGL, MSFT have all greatly pleased the market. The sp'2060s look due tomorrow... with a viable weekly close within the sp'2065/75 zone.. and that would kill any remaining hope of a broader bearish scenario into end year. 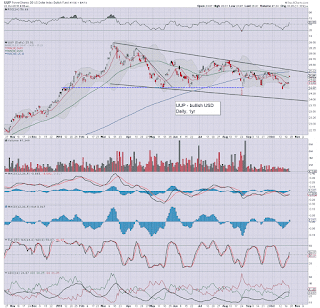 Sp +9pts in AH.... equiv' to 2061... breaking the 200dma. 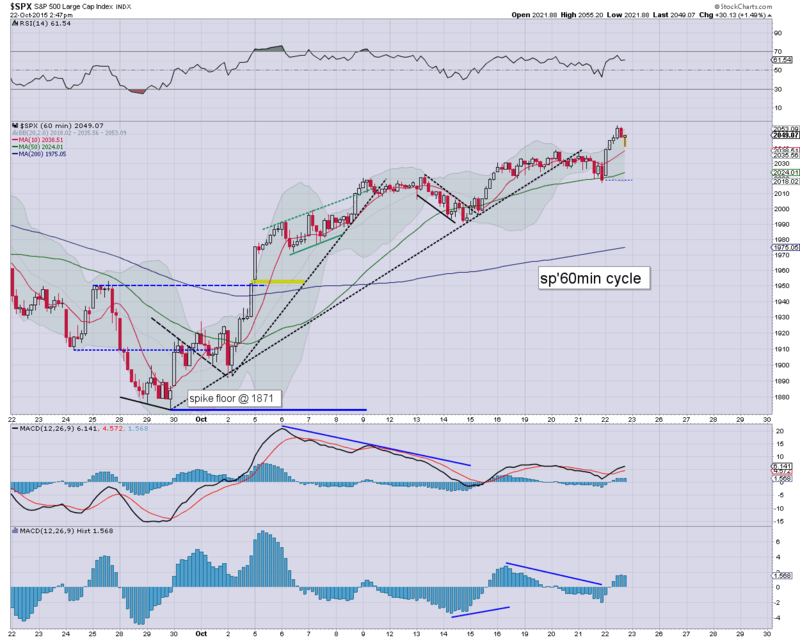 The sp'500 has seen a moderate down wave from 2055 to 2041, but still looks set for a daily close in the 2050s. VIX remains very subdued, -9% in the 15s. USD is holding very sig' gains of 1.3% in the DXY 96.30s. Without question, a day when the equity bears really felt some pain.. and with the Nasdaq already breaching the 200dma.. there is little reason to expect anything different until at least after next Wednesday's FOMC. 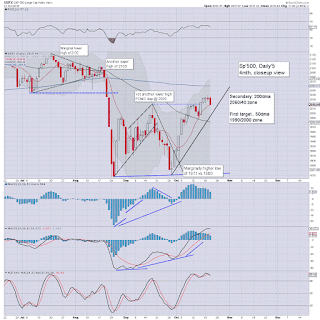 US equity indexes are holding significant gains, with the sp +31pts @ 2050. 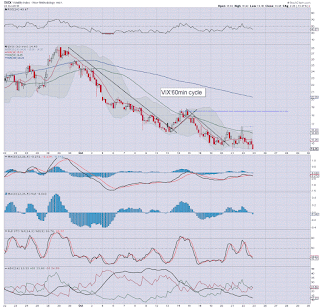 VIX remains under strong downward pressure, -10% in the 15s. USD has built powerful gains of 1.3% in the DXY 96.20s. Metals and Oil are broadly flat. Unquestionably.. it has been a rather important day for the equity bulls, with an initial break above the 200dma for the Nasdaq comp'. Regardless of whether it closes above or below... they are sig' gains. A late VIX update from Mr T.
As autumn proceeds, each and every day increasingly favours the bulls. We're seeing bullish MACD crosses on the weekly cycles (sp', Dow, Trans).. and with each week.. momentum swings increasing toward the bulls. For the moment, this remains no market to short... not least with the FOMC next week. If the market interprets whatever is in the next statement as 'good for continued easy money', a monthly close above key resistance looks probable. .. and if that is the case.. then it really will be sunset for the bears, with the next realistic opportunity not until late spring 2016. 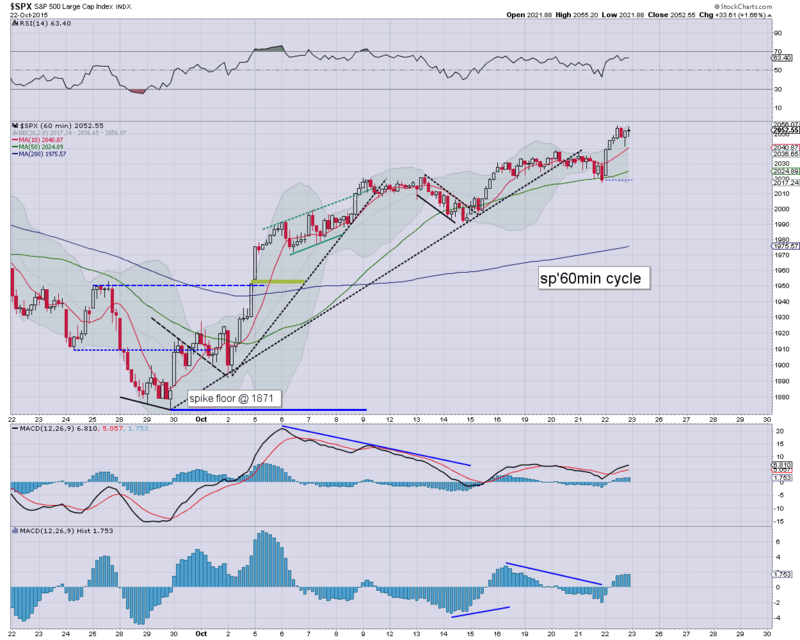 US equities are holding rather significant gains, with the sp'500 in the sp'2040s. 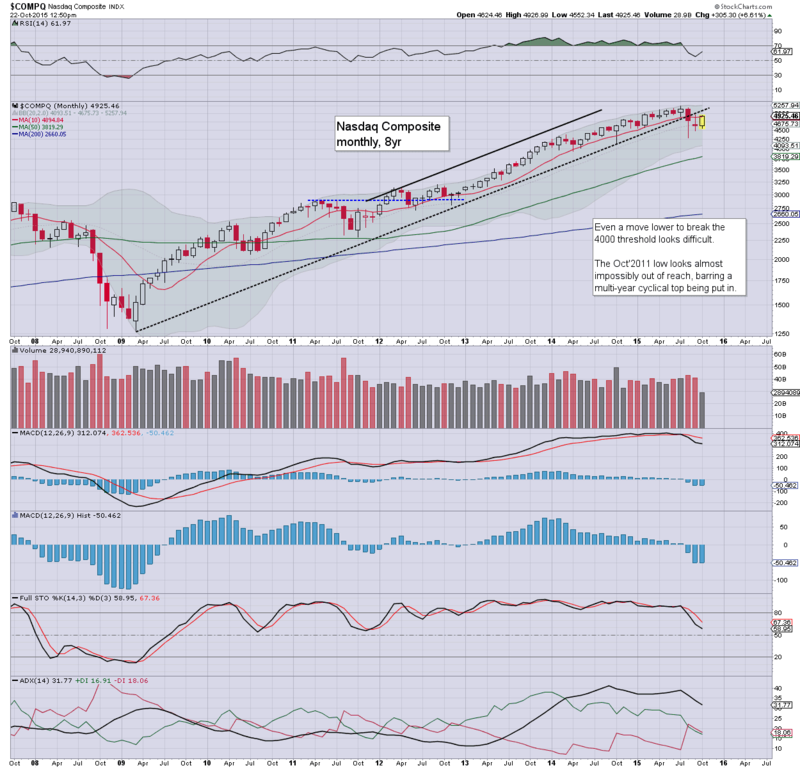 More notable though, the Nasdaq comp' which is very close to breaking back above the 200dma. 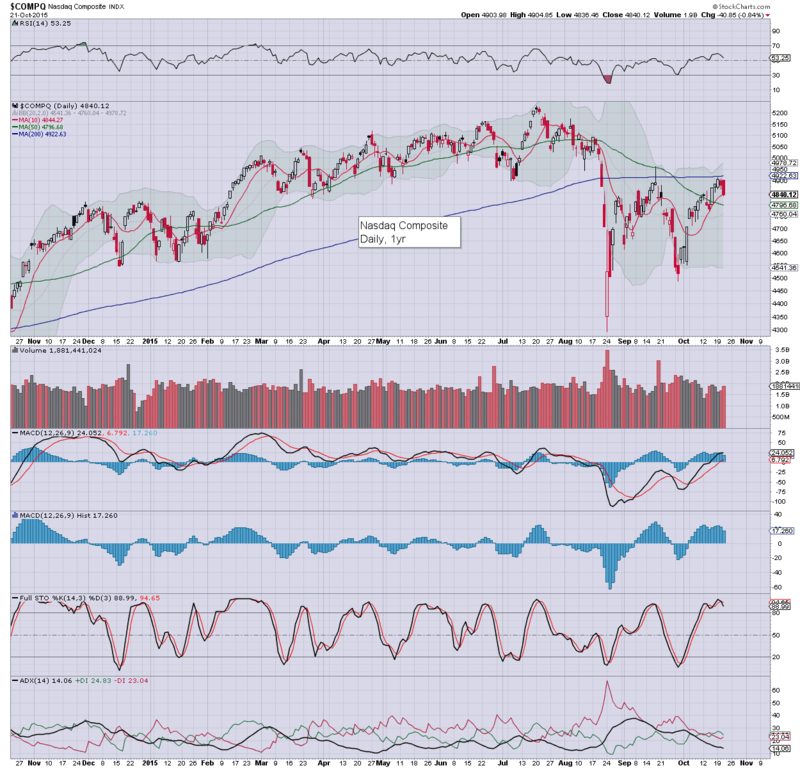 A daily close in the 4930s would be rather definitive, and bode for sp'2060s early next week. Now it is simply a case of either the market reverses from here.. or we're about to see the first index break over core resistance. With price action as it is, I can't be bearish. 12.26pm... Things are spiralling up... Nasdaq just 4/5pts away from the 200dma. 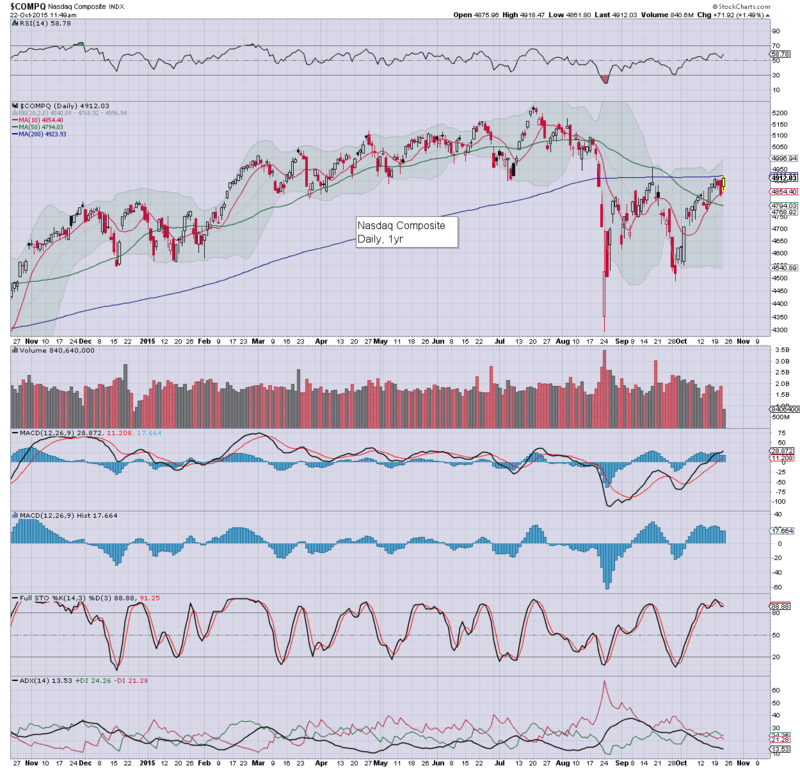 With sp'2052... juist 8pts to the 200dma. After 2060.. its open air to the May high of 2134. 12.41pm.. Nasdaq is the first of the main indexes to re-take the 200dma. 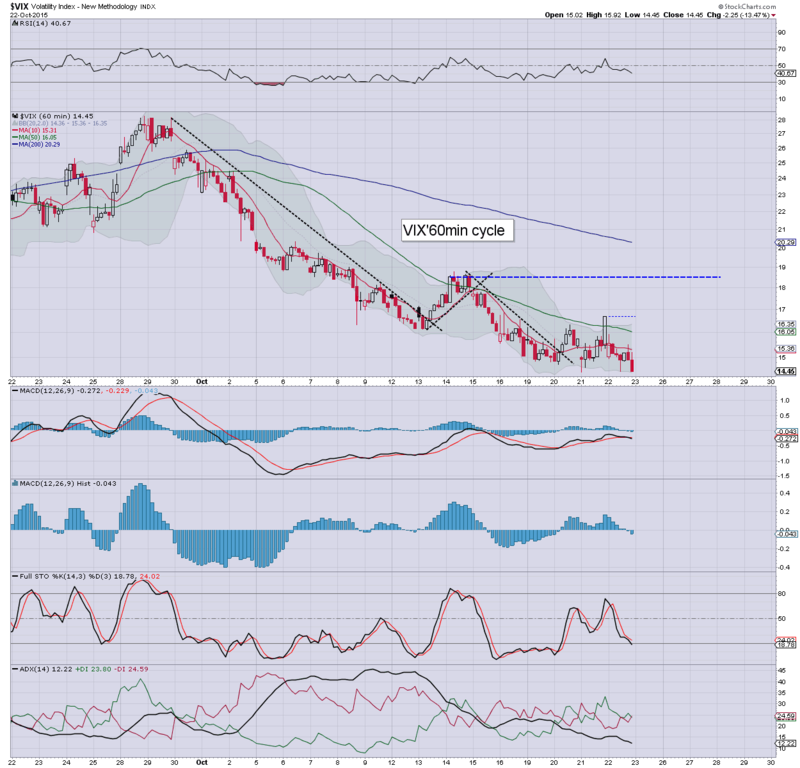 VIX melting.. hitting a new cycle low of 14.45. Whilst US equities battle to hold significant gains, back in the sp'2040s, there remains the ultimate issue... will the market see an epic fail at core resistance? 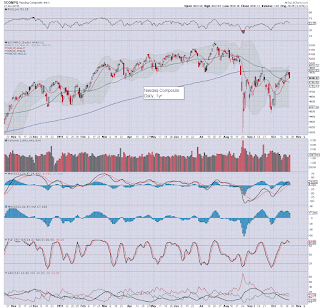 An October close above the monthly 10MA - currently @ 2046, would be very bullish into year end.. and across spring 2016. I endeavour to keep an open mind.. and it will always be important to 'think the unthinkable'. The current green candle on the monthly chart should scare the hell out of those who believe we are due some degree of renewed collapse wave. We sure didn't get any green candles in the previous two grand down waves, did we? 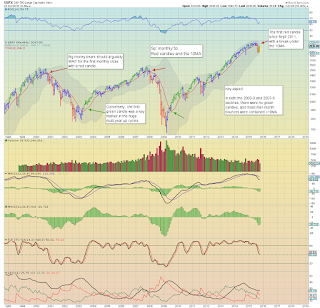 Neither did we get any monthly closes above the 10MA. I realise some out there will claim I am over simplifying matters.. but really.. price is all that really matters... and right now.. the market is on the edge of a massive recovery/breakout. So, go stare and dwell on that this hour. 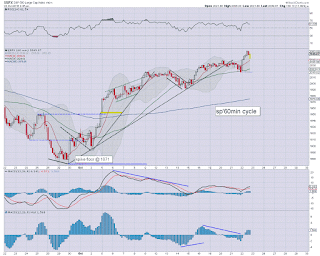 US equities are trying to build significant gains, with the sp' back in the 2030s. Equity bulls should be a seeking a daily/weekly close in the 2040s. 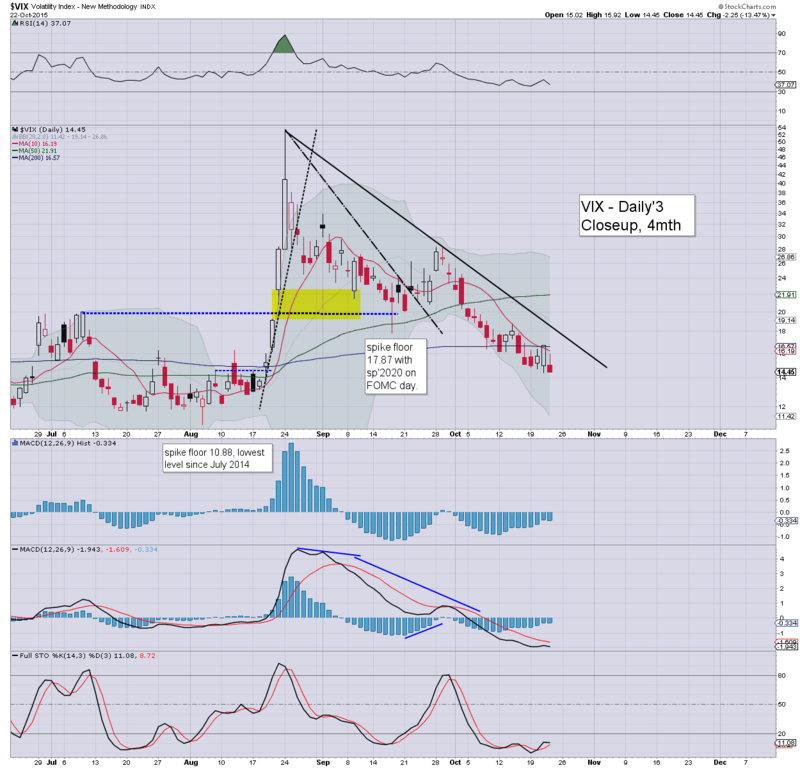 VIX is naturally being crushed back lower, -7% in the 15s. USD is building sig' gains of 1.0% in the DXY 96.00s. *the gains in the USD are unquestionably a result of Draghi alluding to further QE. 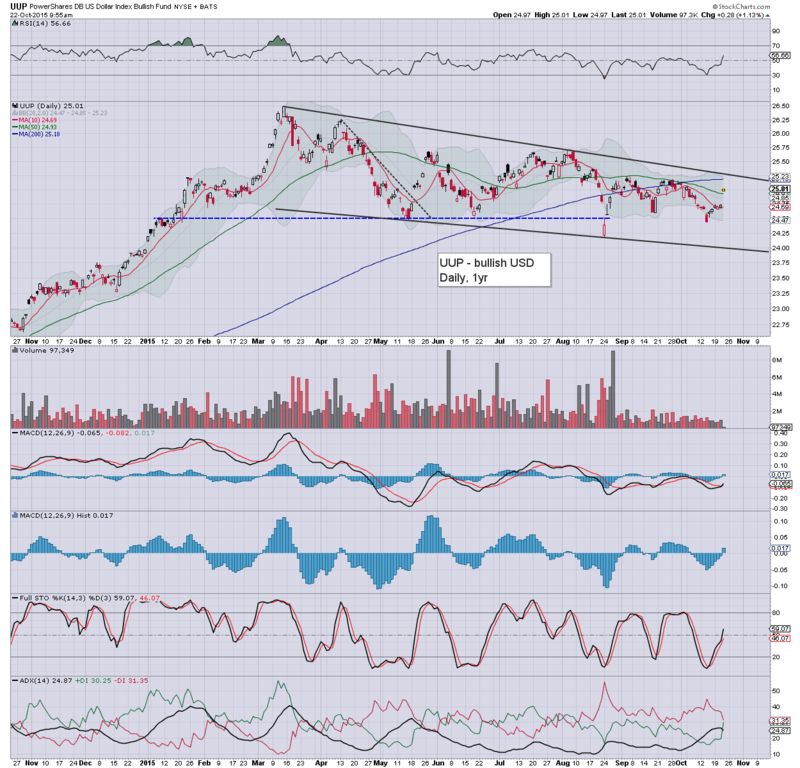 Again, a higher USD will not be good for the giant US multi-nationals. For now though.. its mostly all chop until a break/close >DXY 100. We have a rather interesting day ahead, not least with further earnings at the close. A daily close in the 2040s would give high confidence that a test of the 200dma is due next week. Eyes on the Nasdaq... and China.... they are likely to offer first key signals of a hyper-bullish breakout. 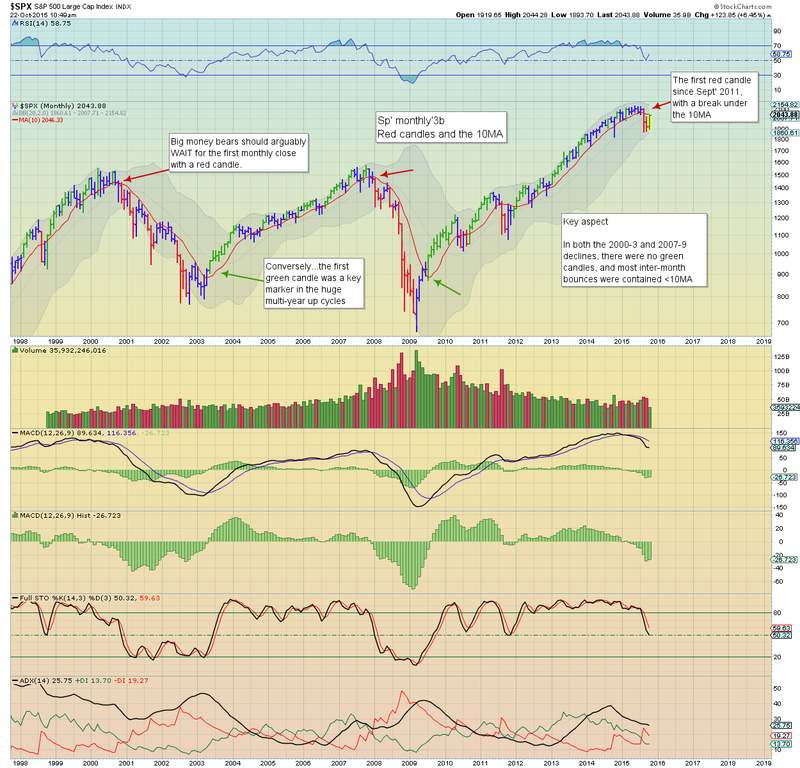 The equity bears are running out of time.... if not already. 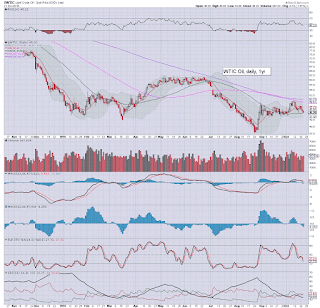 RE: Oil, +1.6%.. at the current rate, it will take a good 3-4 days to turn positive MACD cycle... for the next chance of a break >$50. I remain LONG-USO. 10.02am.. and here are the sp'2040s. Existing home sales 5.55 million... rather good (well, relatively). ... and here comes Hillary on Benghazi. That is bullish, yes? Good morning. US equity futures are a little higher, sp +3pts, we're set to open at 2021. With the ECB leaving rates u/c, the USD is trading flat in the DXY 95.00s. Metals are flat. 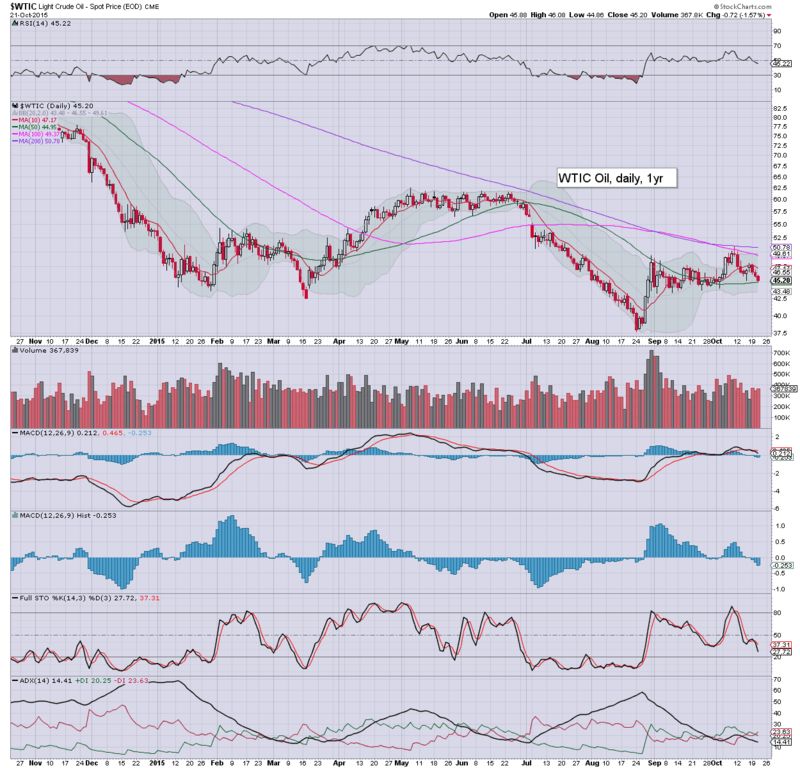 There is notable early strength in Oil, +1.3% in the $45s. *ECB press conf' with Draghi is around 8.30am EST. Market will be looking to the press conf' more than the earlier announcement for 'inspiration'. Corp' earnings continue to come in... and so far this morning... they are reasonable, but many companies are still missing on revenue. A break into the sp'2040s will be important, whether late today or tomorrow, makes no difference. For now... there seems little chance of sustained/significant downside until after the next FOMC. EBAY +6.8%.... now having to cope without paypal. China: rebounding, settling +1.4% @ 3368. 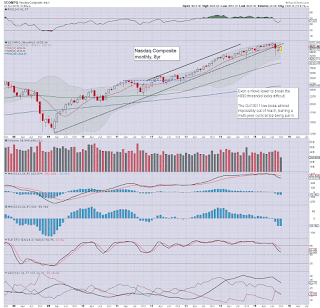 A weekly close in the 3400s is rather important.. otherwise the brief foray >3400 will count as a FAIL at resistance. 8.33am... Draghi begins... and the market reacts. Euro drops... USD +0.4% in the DXY 95.50s. sp +5pts.... clearly nothing significant... so far. 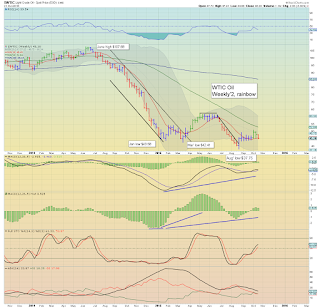 Oil holding sig' gains of 1.7%.. despite the jump in the USD. With the latest EIA inventory report showing a net weekly surplus of 8.0 million barrels, WTIC oil prices remained on the slide, settling -$0.72 (1.6%) @ $45.20. Near term outlook is uncertain, as the underlying problem of too much supply has not been addressed in any significant way. Suffice to say.. the bigger weekly charts are flashing warning signs again, with a red candle. If the week closes red, then it bodes for a problem for the oil bulls into Nov', and that sure won't help the broader US equity market. So, lets see how Oil trades across Thurs/Friday. 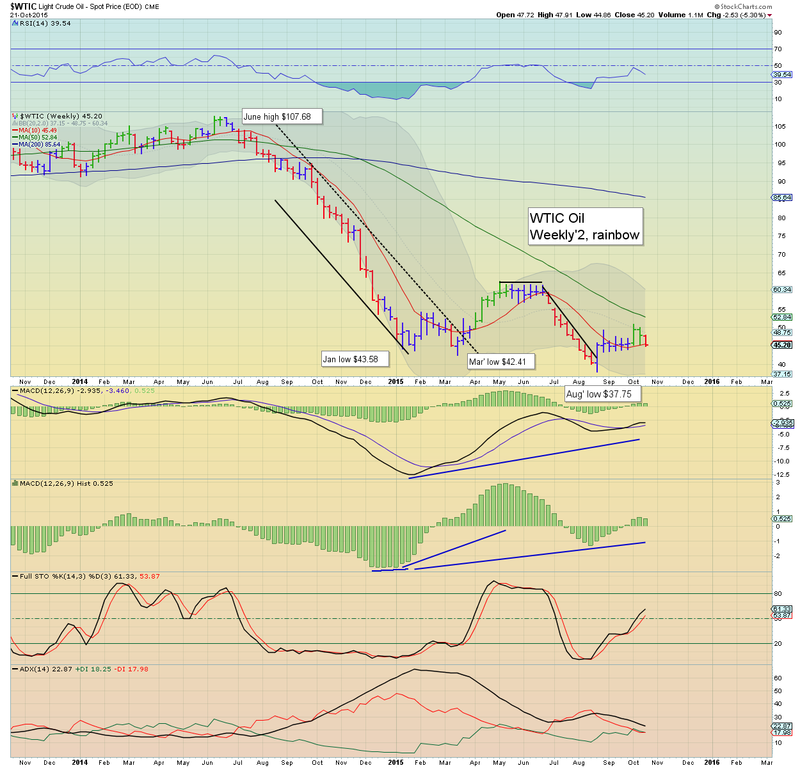 Oil bulls really should be desperate to see a weekly close at least in the $46s. Thursday will see the usual weekly jobs, house price index, existing home sales, and leading indicators. *far more important though.. ECB announcement/press conf'.